Emma Gutteridge / Getty Images. A recipe for a healthy vegetarian sandwich wrap, inspired by the flavors of Greek cooking, including feta cheese and lightly marinated veggies, wrapped up in a healthy whole wheat flour tortilla. 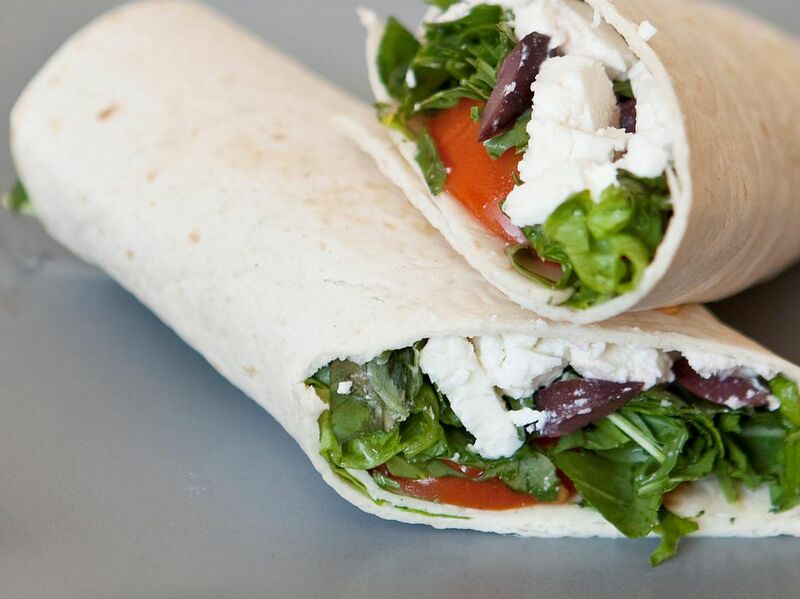 This Greek vegetarian sandwich wrap recipe makes a great lunch or snack. Recipe and photo courtesy of the Wheat Foods Council. In a medium bowl, combine all of the ingredients except for the tortillas. Let stand for 20 minutes, stirring occasionally. Drain off liquid and divide salad mixture among the tortillas. Fold bottom of tortilla partially over filling and then roll up. Nutrition: One serving provides approximately: 267 calories, 9 g protein, 31 g carbohydrates, 4 g fiber, 15 g fat (5 g saturated), 25 mg cholesterol, 39 mcg folate, 2 mg iron, 748 mg sodium.